The enthusiasm gathered strength as the evening progressed, and toward the close it became tumultuous. Hats and hankerchiefs were waved; there were cheers and shouts; there was no such thing as restoring order until the audience began to realize that it was imposing on the good nature of a lavishly generous artist. The annual induction of new members into the Rochester Music Hall of Fame is upon us. And thereby hangs this tale. Recently, while paging through the online edition of City Newspaper, I ran across a chain of comments relating to how the Rochester Music Hall of Fame (RMHF) selects its inductees, with several questioning whether talented locals are overlooked in favor of outsiders who may have more “celebrity.” One somewhat overheated commenter argued that Jenny Lind, the “Swedish Nightingale” — one of the greatest sopranos of the 19th Century — should not have been chosen as a charter member of the RMHF. After all, Lind’s only connection to Rochester was stopping here for two concerts in the 1850s. That thought crossed my mind as well. But not from the perspective of “locals’ versus “outsiders. ” Rather, I wondered why stellar musical artists such as Enrico Caruso, Sergei Rachmaninoff, Gustav Mahler, Jascha Heifetz, and George Gershwin — all far better known today than Miss Lind and all also having a Rochester performance on their resume — had been overlooked year-after-year by the RMHF’s selection committee. 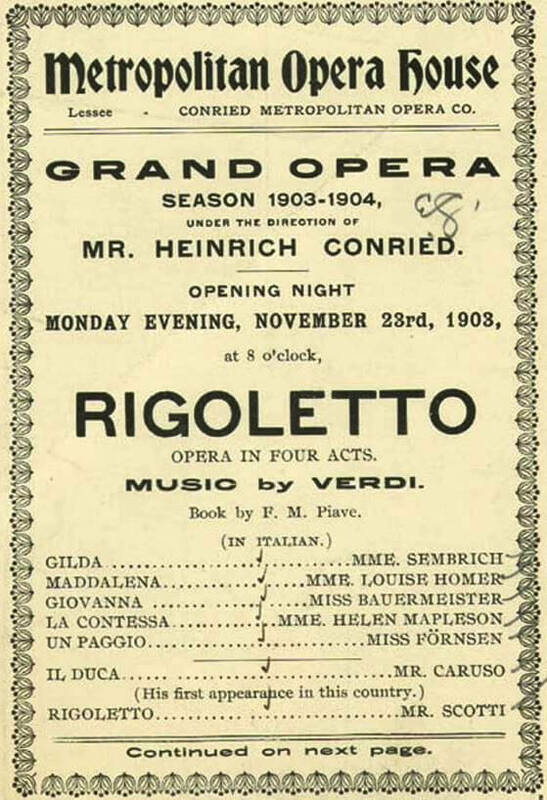 A 1908 Caruso recording on the Victor label. As luck would have it, Karl LaPorta, one of the founders of the RMHF and former member of its board of directors, was party to the discussion. Karl pointed out that, as far as he knew, none of those celebrities had ever been nominated! Karl also explained that the RMHF had not inducted Miss Lind herself into the hall, but rather her Rochester performances were recognized. To rectify this glaring omission, and as a life-long fan of Caruso via a collection of scratchy 78rpm records, I immediately went to the RMHF website and nominated Enrico. 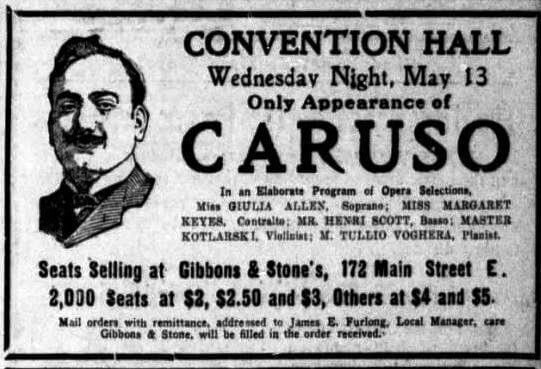 Given his legendary abilities, Caruso towers over any other performer who ever appeared in Rochester. If the RMHF selection committee applies the same criteria to his nomination as applied to Ms. Lind’s — or rather to her performances — then the induction of Caruso’s performance should be a foregone conclusion. But we’ll have to see. So to some extent, this article can be viewed as a commercial advocating Caruso’s selection. 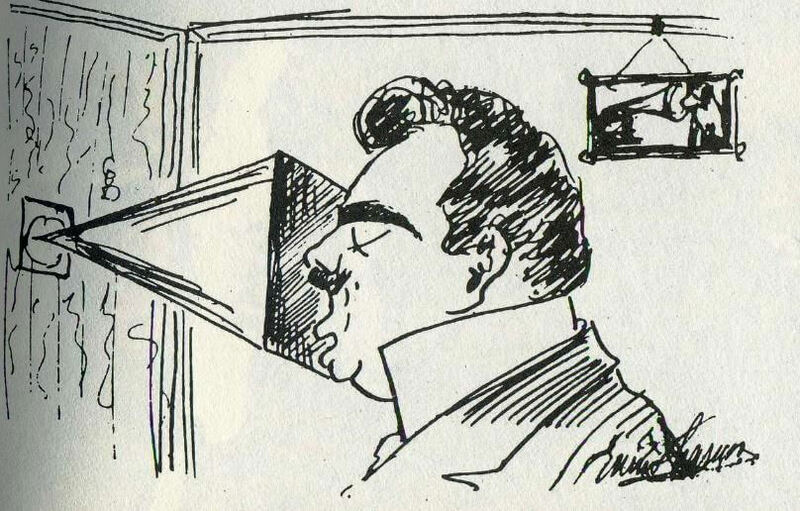 Self-potrait of Caruso making a recording. Note Nipper, the Victor mascot in background. Around this time, Caruso attracted the attention of the fledgling recording industry. The two were made for each other, and to a large extent made each other. Very few people would ever hear a live operatic performance. But phonograph records made it possible for millions to experience a touch of the beauty and majesty of the operatic stage. 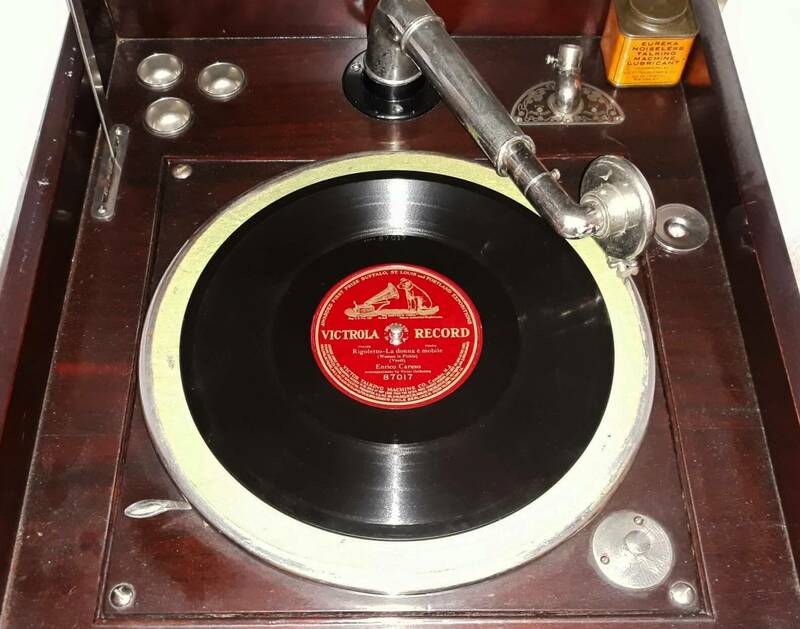 While sales of records and phonographs were already building, the industry needed a spark to really set it off. Caruso was that spark and was soon on his way to becoming the recording industry’s first superstar; his 1902 recording of “Vesti la giubba” from Pagliacci being the first record to go “gold” by selling over 1,000,000 copies (and at $.75 a piece). And as his recording career blossomed, so did his operatic career. 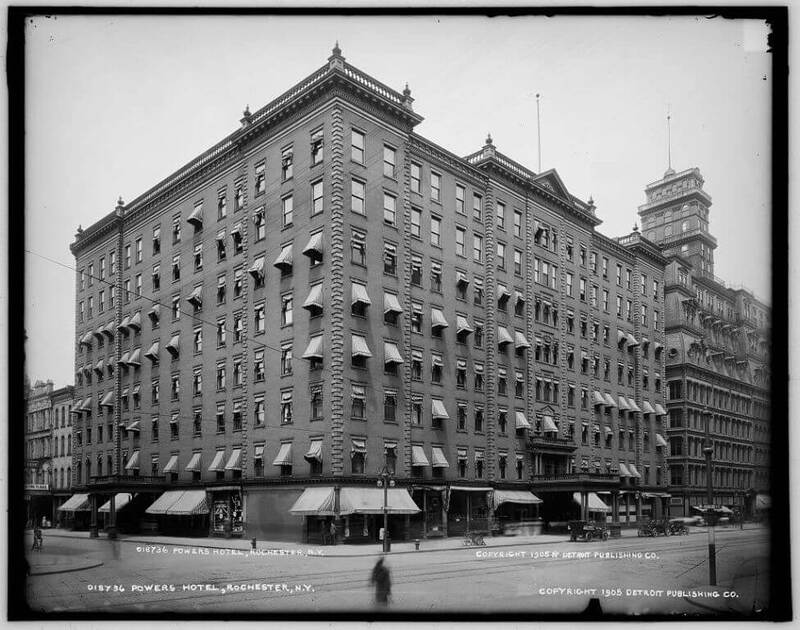 On November 23, 1903 Caruso made his debut withthe Metropolitan Opera in New York, the venue he thereafter considered his professional home. During the next decade and a half he gave over 700 performances at the Met, averaging 40 a season and, with but one exception, starred in every opening-night production, always to sell-out crowds. Scalpers routinely sold his tickets at up to 500% above box office prices. The financially-troubled Met was almost single-handedly (single-voicedly?) saved by Caruso. And through his recordings he brought an appreciation of opera to small-town America, helping to expand what had been viewed as a somewhat snobbish cultural attraction only of interest to the denizens of a few major cities, to over 1,000 opera companies and workshops nationwide. Which brings us to the night Caruso sang in Rochester. Caruso was also nervous about performing outside of the formal operatic structure. Standing on an empty stage singing an aria, sans costume, made him uncomfortable. So when the Wolfsohn Musical Bureau proposed a personal appearance tour, Caruso tried to scare them off by demanding the outrageous sum of $6,000 per concert which, to Caruso’s shock, was immediately accepted. “E pazzo!” (He’s crazy“) Caruso said of the tour’s impresario. But he took the money. Patrons were promised, “The greatest tenor in the world. 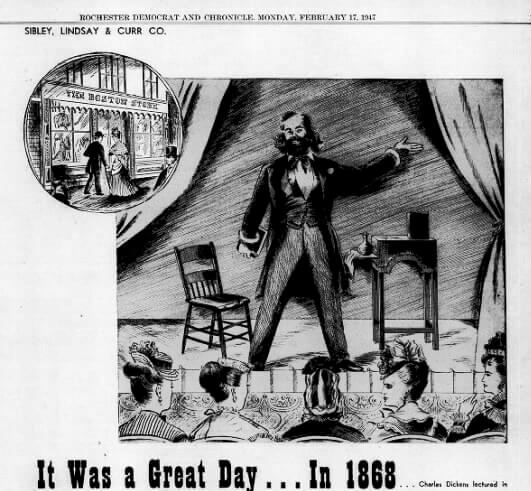 His voice has a thrill that is electric, and a splendid physique gives it power enough for the largest halls.” The hall could seat two thousand, with reserved seats priced from $2.00 to $5.00, and general admission for $1.00. The program consisted of a dozen vocal and violin pieces, with Caruso singing just three arias. IV. “Bisogna soffrire per essere grandi !”(One must suffer to be great). 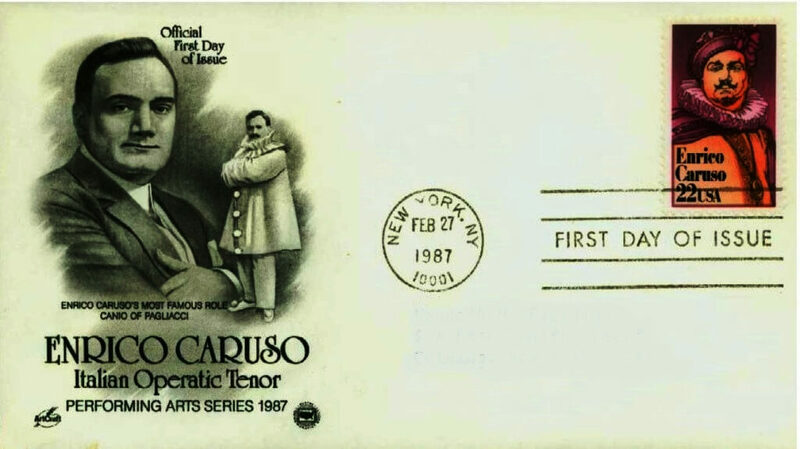 It was a saying Caruso often repeated and, following his 1908 concert tour, Caruso suffered in spades. The year began well. As Caruso finished his tour in May, he was feeling on top of the world. His voice and health were good. His reviews at the Met and for his concert tour had all been boffo. His debut at the famous Opéra in Paris was coming up in June. The money was rolling in. 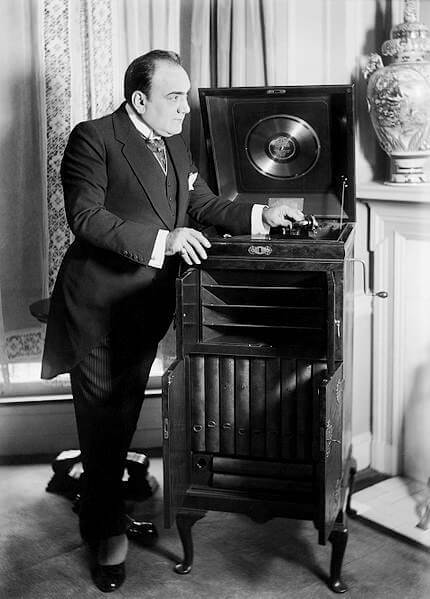 Between his salary at the Met, his concert fees, and royalties from the booming sales of his records, Caruso had banked almost $190,000 in the past year. (8) Then the roof caved in. Then in December 1920, coming down with what he thought was a cold, he collapsed on the stage of the Met while performing “Pagliacci.” Pneumonia and pleurisy followed, along with a series of surgical procedures. But in the spring Caruso had recovered enough take his wife and new daughter home to Naples. 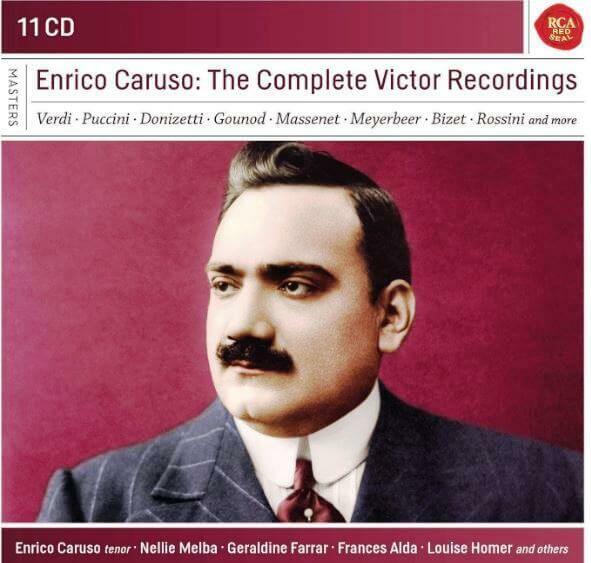 Despite being recorded over a century ago, most of Caruso’s records have been re-mastered and are still available today on CDs or via downloads or streaming media. Considering that all his recordings were made acoustically — requiring him to sing into a metal horn as the sound waves were mechanically relayed to a stylus which cut the master disc — and considering that the recording quality is not the best, no matter how much digital enhancement is applied, the availability of the bulk of his work is testament to Caruso’s enduring popularity in the marketplace. 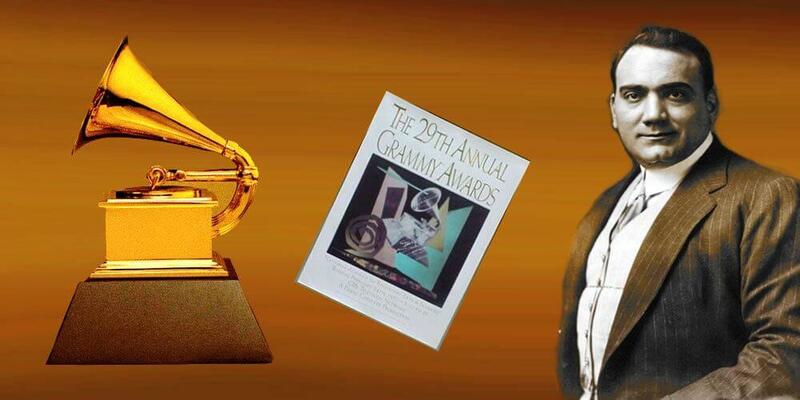 In 1987 the National Academy of Recording Arts and Science awarded Caruso, who had been dead for 66 years, a Lifetime Achievement Award. That same year the US Postal Service honored him with a postage stamp. And Caruso even has a star on the Hollywood Walk of Fame, although I’m not sure that’s an honor considering some of the entertainment industry lightweights he has to share the pavement with. (1) Caruso would never again perform in Naples, later stating he would return, “only to eat spaghetti”. (2) Reportedly, at a concert in Yankee Stadium, without any form of amplification, his voice could be heard clearly throughout the ball park. (3) Going beyond recorded music, and taking a tentative step into the future, on January 13, 1910, the live voices of Caruso and other stars of the Met were broadcast by Lee De Forest over his primitive transmitter in New York City, where his signal was received by the public and press, using earphones and crystal sets to listen to the world’s first public radio broadcast. (4) Caruso didn’t play favorites. He also endorsed pianos, cigarettes, and throat lozenges. (6) In addition to Caruso, among the world-class performers who appeared on the Convention Hall stage were: George Gershwin (where he apparently performed “Rhapsody in Blue” for the first time outside of NYC), Fritz Kreisler, John McCormack, Gustav Mahler, Ignacy Paderewski, Geraldine Farrar, Nellie Melba, and Sergei Rachmaninoff. 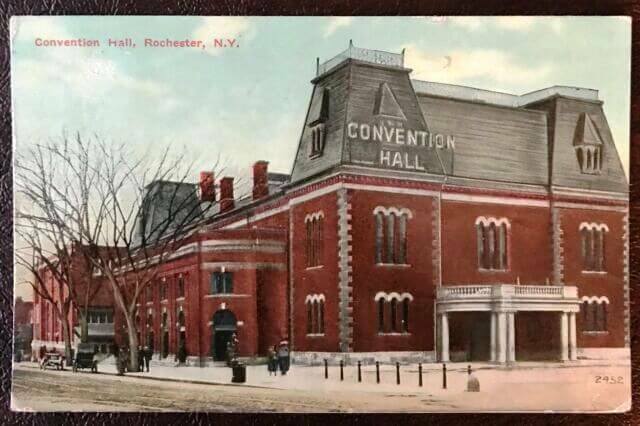 For obvious reasons, I’ve also nominated Convention Hall for inclusion in the Rochester Music Hall of Fame. (9) After WWI, in what has to be one of the strangest attempts in cinematic history to play off a performer’s popularity, a man renowned for his singing was hired to make two silent movies…at a salary $100,000 each. 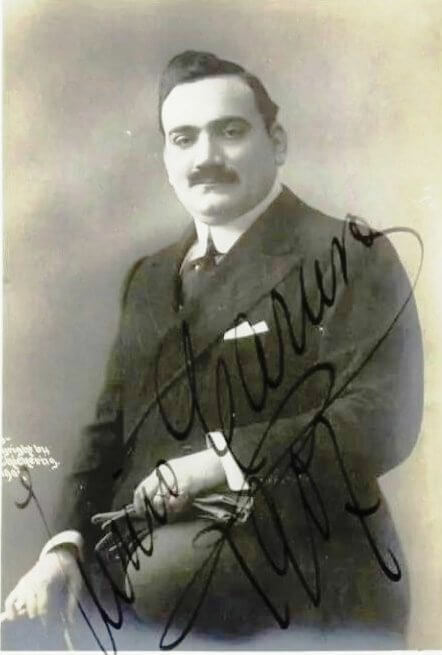 In the first, Caruso played a dual role, as an Italian tenor (silently “singing” his famous aria Vesti la giubba) and as his cousin. A subsequent review of the movie stated that,“ few films ever enjoyed less success.” For those so inclined, it can be viewed on YouTube: https://www.youtube.com/watch?v=BtDG_3o_1-E. The second movie was even worse. So bad that it was never released. (10) As was later done with Lenin, Caruso’s embalmed corpse was kept on public display, in the Cimitero Del Pianto in Naples, where he was annually re-attired in a new suit. After eight years as a tourist attraction, his widow finally managed to get him buried for good. Third time is the charm; Pruitt tells us what will happen: "Pennant Race '19 in Eight Sestets and a Couplet"